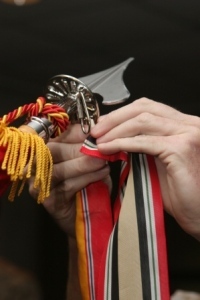 This U.S. Marine Corps Battle Streamer set consists of 54 doublesided & double embroidered rayon streamers. They measure 2 3/4" wide and are available in regulation 2 3/4" x 3Ft lengths. They are made to official U.S. goverment regulations (MIL-DTL-14650/2J). Please note- Streamer sets do NOT come with a streamer holder. You can find these in our "Guidon Pole Accessories" page. Please note that each and every streamer is custom made for each organization and take 2-3 weeks to ship.